The regional bank and lottery ticket basket strategies are updated on the last Monday of each Month. The price shown in the following tables will be from last Friday. I frequently use a basket approach, particularly with industry sectors, that will vary in size as to the number of components. The focus will be on the total return of the basket, rather than individual components. Some of the advantage to this approach include diversification and risk mitigation. I am not concerned about a few mishaps provided other components are doing better than I anticipated when I made the initial purchase. As noted previously, I have been surprised by some of best and worst performers in the regional bank basket. The name of the strategy aptly describes the risk. It is somewhat analogous in many cases to playing a hand of blackjack for the purchase amount knowing that the card count favors the house. It is a form of entertainment and an alternative to a casino visit. Based on the results to date, this strategy is far more likely to produce positive results even with the LB's skill at the tables. The primary purpose of the LT strategy is to entertain Right Brain, let it swing for the fences with up to $300, and to keep the Nit Wit from interfering with Left Brain's management of Headknocker's portfolio. A. Bought 150 of RSHYY at $1.536 (see Disclaimer): RB went way off the reservation and into outer space with this buy. RB has a fondness for hydroelectric power plants, clean energy and all of that stuff, and it apparently did not matter to the NIT WIT that the RSHYY power plants are located in Russia (soon to be renamed PutinStein), and the ordinary shares are priced in depreciating Rubles. RusHydro JSC is a Russian company that owns hydro-electric plants in the motherland which immediately required the LB to categorize this stock as a Lottery Ticket. According to the profile at the pink sheet exchange, RSHYY is the largest hydro-generating company in Russia and the second largest in the world. LB refused to do any research, noting that it was too dangerous to visit any website in Russia and highlighting the recent experiences of unsuspecting foreigners who used their cellphones during the winter Olympics. Within a few minutes, the phone would be infected with all kinds of viruses. CNET (some disputed those reports, but I had no trouble believing them) So, since I could not find any earnings reports available outside of the Russian Federation, I did not review any. I was not looking for a Russian company to buy as a LT. I simply read at an article published by Barrons.com, who quoted a "savvy" money manager who identified this company as one poised to double or triple. The article references that analyst estimates compiled by FactSet show earnings per share rising from 9 rubles in 2014 to 13 rubles in 2016. Assuming that estimate is based on the ADR per share, rather than the ordinary share E.P.S., and that is not clear, the USD 2016 E.P.S. for the ADR would be about $.3645 at the 4/9/14 exchange rate or around a 4.225 P/E. I am okay with refusing to review reports which may be available at this firm's website, since I would not place much faith in them anyways. Vlad has created a state built on "cronyism and Kleptocracy", as noted by The Washington Post, and that kind of economic system is not run for the benefit of shareholders or average citizens. And, it is well known what happens to a company that upsets Vlad. Tax problems will be discovered capable of sinking the company who has offended Putin, and there is no protection from a compliant judiciary who would never challenge the official line. One only need to remember what happened to Yukos. Another problem is that the perpetual mismanagement of the Russian economic system is causing a devaluation of the Ruble against the USD. USD/RUB Currency Conversion Chart Russia is like Argentina, where the ruling elite has found myriad ways to keep the nation from ever coming close to its potential. Needless to say, I would not view the Ruble as a desirable store of value, and there is considerable risk without question that its value may continue to slide against all major currencies including the USD. A further decline in the RUB versus the USD after my purchase will be reflected in the USD price of RSHYY. Russia is a terribly mismanaged country. If I assumed a continuation of the current $.2 per share quarterly distribution, which does not appear to be a reasonable one to me at least, then the dividend yield at a total cost of $5.56 would be about 14.39%. A reduction to $.15 would equate to a 10.79% yield at the $5.56 total cost number. The common shares have a higher current yield, but it would not be surprising to see a dividend cut based on the current payout of per share and the last earnings for the Q/E 12/31/2013. Adjusted FFO for 2013 was $.74 per share and RSO paid out $.8 per share in dividends. I just gave up on this one. I simply view the trend toward lower cost tablets with more free or lower cost programs for children to be a major headwind for LeapFrog. Staff here at HQ has noted that the RB has tilted the recent LTs buys toward those producing income and slightly away from non-income producing LTs like RSH and LF. 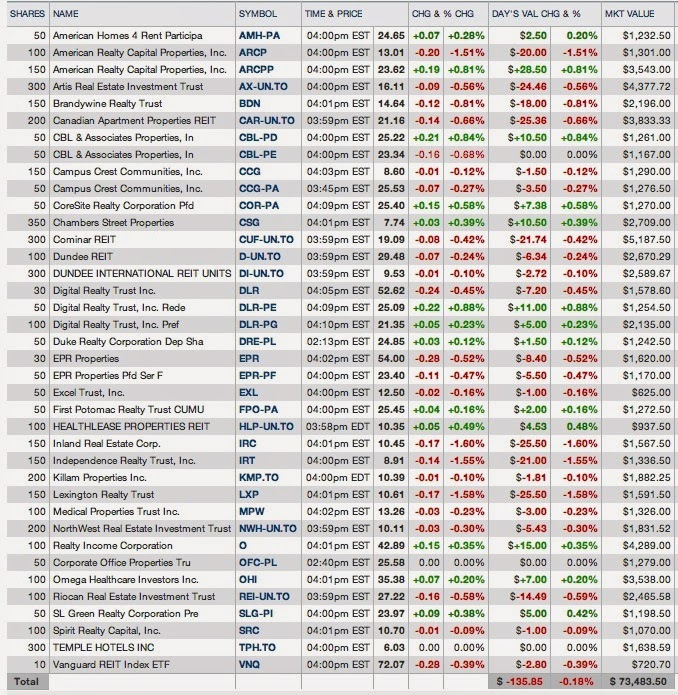 The REIT basket held up well last Friday, declining only $135.85 or .18%, slightly better than the VNQ decline of .39%. This basket continues to expand, though there have been some preferred stock deletions under the current trading guidelines. 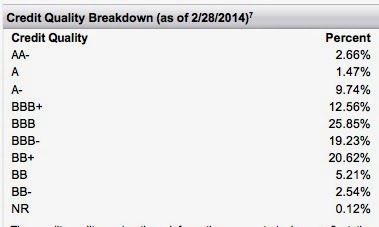 The first publication of this basket was made on 3/5/14: Stocks, Bonds & Politics: Equity REIT Common and Preferred Stock Table as of 3/5/14 I am using a blended strategy of including both common and preferred stocks. I have also recently initiated a starter type position in VNQ which can be bought commission free in my Vanguard brokerage account. I am not discussing most of those small ETF adds. The table also reflects some additions and one deletion that will be discussed in subsequent posts. The two additions are Canadian REITs. The deletion was SLGPRI. This table does not include one of two recently added Canadian REITs. There were no positions sold or added since the last update. Several stocks previously sold at higher prices are moving back into my fair value range. The price declines over the past few weeks have brought a few others near the upper end of my fair valuation range. In 2013, my dividend total from this basket totaled $1,932,93, up from $1,896.25 in 2012 and $1,660.57 in 2011. I will have to increase my current exposure significantly in order to exceed the 2013 amount this year. Regional bank stocks have declined since my last update, as interest rates started to go back down. The abnormally low rates benefited banks some when deposit yields were repriced down, but even 5 year bank CDs taken out in 2008 at higher rates have now matured, and the positive impact of that repricing is no longer present. Instead, the decline in rates compresses net interest margin. When rates were rising last year, regional bank stocks were in an uptrend based on the common belief that higher intermediate and long rates would be a net positive for them, particularly when short terms were likely to remain near zero through mid-2015 and then rise slowly and modestly in 2016-2017. The rate spike starting last May impacted intermediate and long term rates. Short term rates remained anchored by ZIRP. The SPDR S&P Regional Banking ETF closed at $42.15 on 4/1/14. KRE closed last Friday at $38.77, or an 8% decline since 4/1/14. It looks like this sector will be in correction territory soon. The problem is highlighted by regional bank earnings for the first quarter. Money center banks have sources of income that are not meaningfully available to small banks whose bread and butter primarily involves taking deposits and lending those funds to small businesses and individuals. A story last week in the WSJ.com noted that new home loans, an important lending activity for smaller banks, fell to a 14 year low during the first quarter. The refinancing tsunami has just about run its course. The decline in net interest margin highlights the problem. The capital ratios are very high, but the NPA ratio increased to 1.44% from .83% in the year ago quarter. The increase in NPA was due to two large commercial loans going into non-accrual. Needless to say, that is a negative. An investor wants to see both the NPA and NPL ratios declining as the economy improves. The dividend yield is good at the current quarterly rate of $.26 per share. 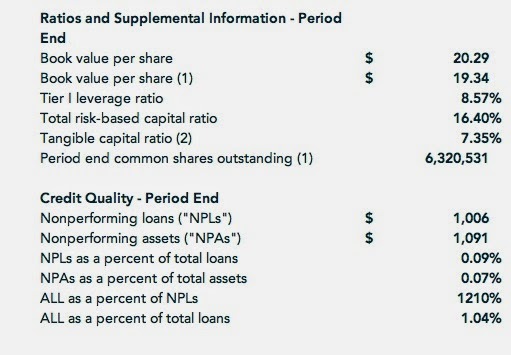 Citizens & Northern Corp (CZNC) Dividend Date & History - NASDAQ.com While the payout ratio is high, the bank has a large capital cushion as shown in the preceding snapshot. C. Washington Trust: WASH reported net income of $9.3M or $.55 per share for the 2014 first quarter, up from $.45 in the 2013 first quarter. The consensus was for $.57 per share. The current E.P.S. estimate for 2015 is $2.51. E. Community Bank System (CBU): Community Bank System reported net income of $22.2M, up 9.5% from the year ago quarter. E.P.S. increased to $.54 from $.5. The consensus estimate was for $.52. Net interest margin increased to 3.94% from 3.86%, while the efficiency ratio decreased to 59.2% from 60.3%. For a bank, CBU has a good dividend history. Community Bank The dividend was not cut during the last recession. The quarterly dividend did remain at $.22 from the 2008 third quarter through the 2010 first quarter. The dividend has been raised $.0438 per share in 1986 to the current rate of $.28 per share, without any cuts during that period. Recently, the bank has been raising the dividend in the third quarter. G. FNB: F.N.B. Corporation reported net income of $32.2M or $.2 per share, up from $.18 in the 2013 first quarter.The consensus estimate was for $.19 per share. The E.P.S. consensus for 2014 is $.84 and $.94 in 2015. Organic commercial loan growth increased by 9.8% annualized. H. West Bancorp: For the 2014 first quarter, WTBA reported diluted E.P.S. of $.27 per share. The consensus estimate was for $.25. The Texas ratio was excellent at 6.99%. The tangible equity to tangible asset ratio was at 8.47%. I am now running close to two weeks behind in discussing trades. There appears to be considerable upside resistance in the S & P 500 between 1880 to 1890. I have noticed on several occasions over the past several weeks that rally attempts into that range have been met with selling. On bad market days, the excessively valued momentum names and the Russell 2000 are declining far more than the DJIA and the S & P 500. The momentum names are vulnerable to continued downside pressure. While some of the excesses have already been taken out of those stocks, they are still excessively valued in my opinion. 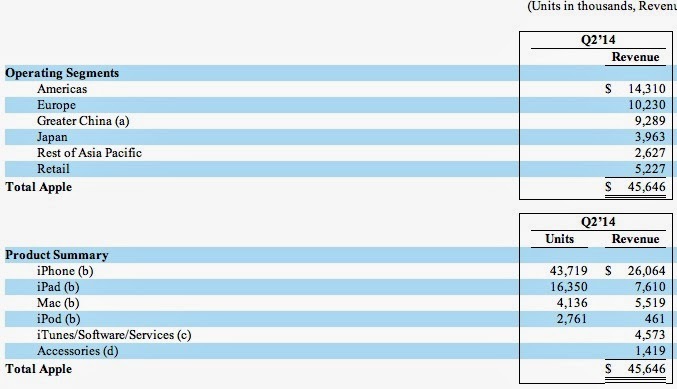 Amazon reported GAAP earnings of $.23 per share for the 2014 first quarter: AMZN Someday, possibly in my lifetime, AMZN will stop spending so much money and actually report a quarterly profit that justifies the current price. A long term secular bull market started on August 20, 1982 when the S & P 500 rose to 113.02 from 109.16. Volume accelerated during the liftoff. Historical Prices | S&P 500 By the end of 1982, the S & P had risen 28.84%. The closing high before the October 1987 crash, sort of a flash crash in retrospect, was at 334.57 on 8/27/1987. The rise from the 8/19/82 close was 206.49%. Until I researched that period again, I did not recall that there was only one correction during this bull move prior to 10/19/87 crash. A correction is defined as a 10% to 20% decline. The current bull move started on 3/9/09 with a S & P close at the 676.53 to nearly 1880 now, or about a 178% increase. There have been two corrections in this period, including one that almost hit 20%, plus a "dip" of almost 10%. (Third Chart from the Top: S&P 500 Snapshot)The current rally has certainly been less smooth riding than that August 1982 to October 1987 move. While no two bull markets will be in identical. the bull move starting in August 1982 has the most similarities to the current market move since Mach 2009. The bond forecast assumes that inflation will average 2% to 2.25% over the next ten years, the current range bound forecast embodied in the 10 year TIP pricing. If that forecast proves prescient, then the low future low inflation numbers will be okay for bonds after rates normalize. The Census Bureau reported that property tax collections rose to $182.8B during the last three months of 2013, topping the peak four years earlier Bloomberg Nashville's property tax revenues rose 13%. I was driving in an area of town last week that I had not seen in about a year. The Bloomberg article has a picture of one of the new buildings under construction in that area, and there are many others just like it nearby. 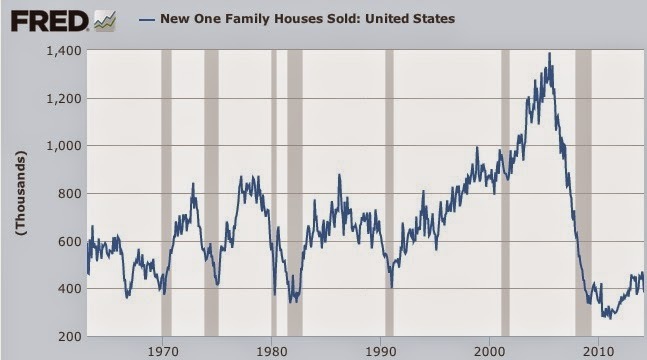 The Census Bureau reported that sales of new single family home in March were at a seasonally adjusted annual rate of 384,000, or 14.5% below the February rate. census.gov.pdf The March number was the lowest level in 8 months and was well below the consensus estimate of an annualized rate of 450,000. New home sales remain at disappointing and anemic levels, hovering near the lowest points hit at the peak of prior recessions. Omega increased its quarterly dividend by 1 cent per share to $.5. This is the seventh consecutive quarterly common dividend increase. This is the third annual dividend received since I bought shares. The symbol has changed from ZFSVY to ZURVY since my original purchase: Item # 2 BOUGHT 100 ZFSVY at $24.72 (February 2012). Anyone clicking the symbol link in that old post will not find a quote. All three dividends have been entirely classified as a return of capital. Zurich is earning the dividend, but is paying it out of capital surplus which causes the ROC classification and also avoids the Swiss withholding tax. Last Friday's closing price: ZURVY: $28.59 UNC. Bar Harbor Bankshares announced a 3 for 2 stock split and a 3.3% increase in its dividend. That is the seventh straight quarterly dividend increase. 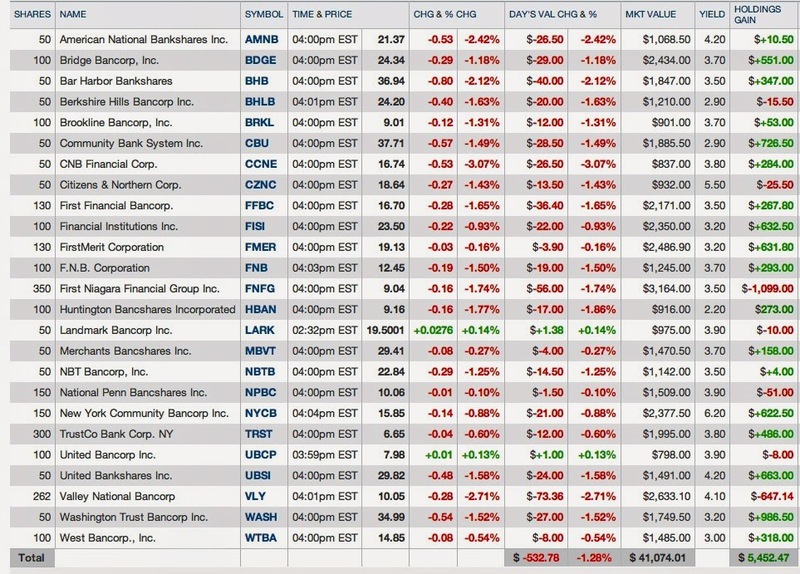 Bar Harbor Bankshares, Inc. (BHB) Dividend Date & History - NASDAQ.com The rate was at $.27 in the 2011 second quarter. The overall increase in three years would be about 23.89%. The post 3 for 2 stock split quarterly payment will be $.223. This will give me 75 shares after the split. ADX is one of my largest stock CEF positions. I first bought shares in 1983 and view it as sort of like my old catcher's mitt, something that I will keep. The ADX 10 year annualized total return through 3/31/14 is 7%, based on net asset value, compared to 7.25% for SPY. SPDR S&P 500 (SPY) Total Returns That period of course includes the catastrophic bear market period. For a long time, ADX was led by Douglas Ober who retired back in 2012. The new head honcho is more aggressive. It would have been almost unthinkable for Ober to buy Facebook shares, but I noted that ADX bought 187,000 FB shares in the 2014 first quarter. 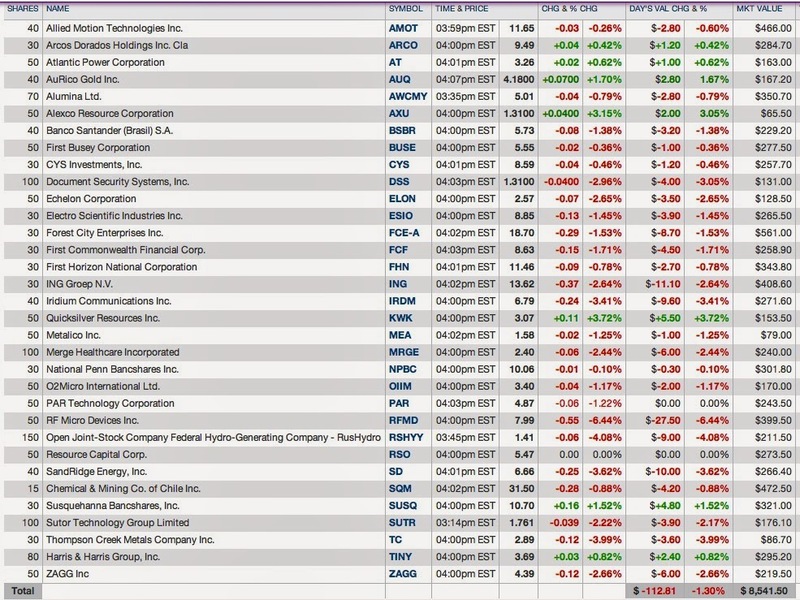 ADX quarterly changes_03/31/14.pdf I am not sure that I understand the eliminations of the MET, CAT, and Ebay positions or the significant reduction in GE. The sheer volume of trading activity in the 2014 first quarter is highly unusual from a historical perspective. In the first quarter, ADX realized $41,897,696 in capital gains or $.45 per share. ADX First _Quarter Report.pdf That is higher per share amount than the total LT capital gain distribution for 2009-2012 and equal to the amount paid in 2013. The annualized portfolio turnover jumped to 63.6% during the first quarter. I am just monitoring the change in style for now. ADX sells a persistently high discount to net asset value. Two ways to narrow that discount would be to start beating the performance of the S & P 500 index and to become more aggressive in share buybacks at the current discount level. Apple announced a 7 for 1 stock split and a 8% increase in its quarterly dividend to $3.29 per share. SEC Filed Press Release Apple increased the stock buyback authorization by $30B through 2015. For the fiscal second quarter, Apple reported revenue of $45.6B and a net profit of $10.2B or $11.62 per share. International revenues accounted for 66% of the total. The consensus was for an E.P.S. of $10.17 on revenues of $43.5B. Cash flow for the quarter was reported at $13.5B. Snapshot of MSPRA Profit: The profit was negligible. Security Description for FPF: The First Trust Intermediate Duration Preferred & Income Fund (FPF ) is a leveraged CEF that invests in bonds and preferred stocks with the objective of generating current income and managing duration of between 3 to 8 years excluding the duration adjustment for leverage which increases duration. As of 2/28/14, the fund claims to have a weighted average duration of 4.46 years. The fund is currently paying a monthly distribution of $.1525 per share. Distributions At a total cost per share of $22.07, and assuming a continuation of that rate which is in no way assured, the yield would be about 8.29%. The fund is about one year old and the average discount since inception was -9.88% as of 4/8/14. Security Description for MSPRA: The Morgan Stanley Non-Cumulative Preferred Series A (MS.PA) is an equity preferred stock that pays non-cumulative and qualified dividends at the greater of 4% or .7% above the 3 month Libor rate on a $25 par value. Prospectus The current coupon is the minimum 4% rate which is likely to remain the applicable coupon for two or possibly more years. At a $20.22 total cost per share, the yield would be about 4.95% currently. Rationale: The current yield differential between MSPRA and FPF is high at about 3.34%, assuming the total cost per share numbers shown above. I would view it as impossible to predict which security will outperform on price. A continued decline in interest rates would probably favor FPF. Risks: FBF has the usual risks associated with leveraged bond CEFs that include interest rate, lost opportunity, credit and normal CEF risks. It is always frustrating when the discount to net asset value remains relatively stable and the market price sinks after purchase creating a wider discount, or the discount widens substantially more than the percentage decrease in net asset value. The potential benefit is that the discount may decrease after purchase as the net asset value per share goes up. This is an identical paired trade to the one described above, except this paired trade occurred in a satellite taxable and involved more shares. The rationale is to increase income generation. In the event of a market correction, and assuming FBF goes up in value, this position could be a source of funds for the purchase of a common stock. 3. Added 50 NMFC at $14.2-Roth IRA (see Disclaimer): This BDC declined in price below net asset value per share after announcing a share issuance. As of 12/31/13, net asset value per share was reported at $14.38, up from $14.06 as of 12/31/12. 10-k at page 68 That was a nice jump and is certainly far better than the static numbers being produced by Prospect Capital. Security Description: The New Mountain Finance Corp. (NMFC ) is a BDC that focuses on "acyclical defensive growth" companies. As of 12/31/13, this BDC had investments in 59 companies with a weighted average yield to maturity of approximately 10.6%. A list of the portfolio investments can be found starting at page 106 of the 2013 Annual Report, 10-k. Prior Trades: I currently own 50 shares in another Roth IRA account: Item # 4 Bought 50 NMFC at $15.03 in the Roth IRA (5/29/13). A one year chart reveals a lot of chop between a $14 to $15.5 channel: NMFC Interactive Chart The two year chart shows more of the same, except that the chop was between $13.5-$14 during April-July 2012. Last Earnings Report: For the 2013 4th quarter, New Mountain reported a net asset value per share of $14.38. Debt/Equity was shown at .63x. "Pro-forma adjusted net investment income" was reported at $.34 for the quarter and $1.41 for the year. SEC Filed Press Release First lien debt is shown at 49.6% of the total with second lien debt at 42%. While the term "lien" gives some comfort, second lien debt can be decimated in a BK, as the first lien debt owners struggle to recover some percentage of their principal far less than 100%. I mentioned one second lien debt issue that I bought once that probably attached to nothing more than air around the firm's HQ given the size of the first lien debt and the losses that ultimately led to a BK. Rationale: As with all other BDCs, my goal is to harvest an annualized total return of 10%. I can accomplish that objective by collecting 4 dividend payments and harvesting a relatively small profit on the shares. The current quarterly dividend is $.34 per share. New Mountain Finance Corporation (NMFC) Dividend Date & History - NASDAQ.com At that rate, the yield at a total cost of $14.2 per share is about 9.58%. Risks: I disfavor BDCs for a variety of reasons, but will buy them in small amounts for their income generation. New Mountain discusses the many risks incident to its business starting at page 25 of its 2013 Annual Report: 10-k Anyone who owns a BDC needs to read the risk summary found in the Annual Reports filed with the SEC. Future Buys and Sells: While I have no current target price, I would likely sell the 50 share lot bought at $15.03 last May whenever I have a profit. Alternatively, I may sell the 100 shares held in the taxable account, bought at $14.28 last June whenever the market price exceeds net asset asset value by 5%. Assuming a net asset value of $14.38, a 5% premium would equate to about $15.1. I might want a higher price, such as $15.2, to pay for the brokerage commission. 4. Sold 50 AMJ at $47.49-Roth IRA (see Disclaimer): This one was held in another ROTH IRA account than the one referenced above in connection with the NMFC purchase. This is just another example of small ball play in the IRAs. Security Description: JPMorgan Alerian MLP ETN is, as indicated an Exchange Traded Note (ETN) that will attempt to track the Alerian MLP Index before fees and expenses. Rationale: I am raising some cash by selling lower yielding securities. Hopefully, better opportunities will arise later in the year, including a possible repurchase of 50 AMJ shares at a lower price. Future Buys: I am in a trading mode for this security. I will consider buying back 50 shares when and if the price falls below my last purchase price. 5. Sold 110 of the Stock CEF STK at $15.65 (see Disclaimer): I sold these shares due to poor performance, to harvest a profit while one still existed and to raise cash in anticipation of redeployment later this year. I received $139.15 in dividends. Prior Trades: I still own 106+ shares in the Roth IRA, where I have been reinvesting the dividend payments. 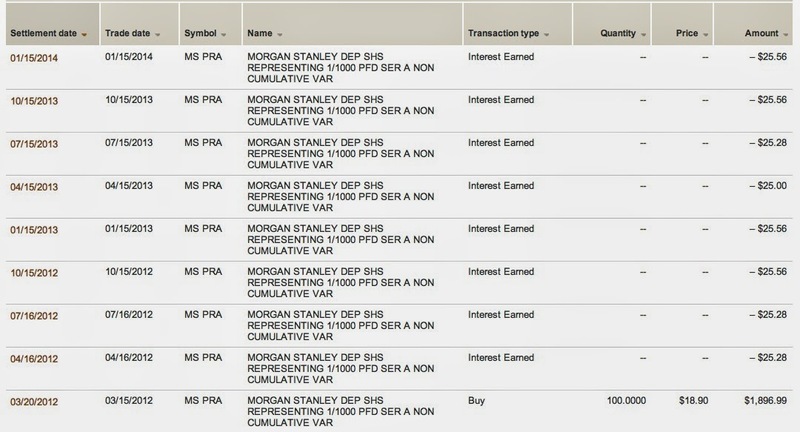 Bought 100 STK at $16.12-ROTH IRA (September 2012). The current quarterly dividend is $.4625 per share. Columbia Seligman Premium Technology Growth Fund Announces First Quarter Distribution: 9.25% Annual Rate for IPO Investors That would equate to about $277.5 in distributions used to purchase more shares in that account. Security Description: The Columbia Seligman Premium Technology Growth Fund is a CEF that invests in technology stocks. I have not been impressed with its performance. Rationale: I decided to raise cash and to fire the managers of this fund, at least for the shares held in the taxable account. This security had actually gone up some from a March 28, 2014 close at $15.61, when the closing net asset value was $16.45. The net asset value had shrunk to $16.14 per share on 4/10/14, the day before I sold this 110 share lot. The net asset value declined further on Friday 4/14, falling $.25 per share to $15.91, and the discount at my sale's price had narrowed to just -1.63%. 6. Sold 50 Wharf Holdings at $14.51 (The $500 to $1,000 Flyers Basket Strategy)(see Disclaimer): This turned into a quick flip. I bought the shares on 3/21/14. The primary rationale was to raise cash in anticipation of a correction, which is admittedly slow to materialize, or to redeploy the proceeds into a higher yielding security which will increase my cash flow available for future investment. A large number of trades over the past several weeks have focused on creating more cash flow without dipping into my existing cash allocation which has already been used as a source of funds for the sector rotation into REITs. Security Description: Wharf (Holdings) Ltd. (4:HKG) is a Hong Kong based conglomerate. I bought and sold the U.S. listed ADR traded on the pink sheet exchange: WARFY Wharf Holdings Ltd. While YMLP paid a good dividend, the entire amount was treated as a ROC. So the amount shown above is in effect my total return of a $2,753.19 adjusted cost basis or just 6.33%. Security Description: Yorkville High Income MLP (YML) is my last MLP ETF. I will not be buying another one. This long article at ETF.Com may be one of the best discussing the various advantages and disadvantages of MLP ETFs and ETNs. Rationale: I now regard MLP ETFs as an unsatisfactory vehicle for owning MLPs. That is just my opinion. Future Buys: I will not be buying another MLP ETF due to the under performance issues caused by the aforementioned tax issue. I will own an ETF that avoids the tax issue by keeping the MLP ownership to less than 25% of assets. Security Description: The Ares Multi-Strategy Credit Fund (ARMF) is a new leveraged closed end fund that seeks to provide an "attractive level of total return" by "dynamically" investing in a broad range of credit investments, including senior loans, junk bonds and structured credit. The shares went ex dividend for the monthly distribution on 4/16, shortly after my purchase. CEFConnect has the first trades occurring on 11/15/13. The initial public offering occurred on 10/31/13 at $25. The closing market NAV per share on 11/15/13 was $23.7, with a market price close at $22.3, creating a -5.91% discount. Since that time, the market price has declined, the net asset value per share has risen unadjusted for the dividend payments, and the discount to net asset value had increased by 67% from -5.91% to 9.9% on the date of purchase. Historical discount information is irrelevant since this is a relatively new CEF. Rationale: This will sound like a broken record, but I am simply trying to create additional tax free income generation in the ROTH IRA by selectively buying higher yielding securities and selling lower yielding ones at a profit. Risks: The track record since launch is good but the fund has experienced an unfortunate CEF risk aptly demonstrated by a rise in net asset value per share and a significant decline in the share price. It is really impossible to say when that will stop and reverse course. Credit risk is also pronounced, but interest rate risk with the short duration is relatively tame. There are certainly risks involved in using leverage to buy junk credits. Future Buys and Sells: I will not buy more shares in a retirement account due to the credit risk issue. I may average down by buying a 50 share lot in a taxable account.